His previous family abandoned him presumably because they could not afford his medical bills. He was left alone and very depressed, with no way of taking care of his own needs, in a high kill shelter where his death was looming. Bear was terrified and there was no one to comfort him and give him the reassurance he needed. 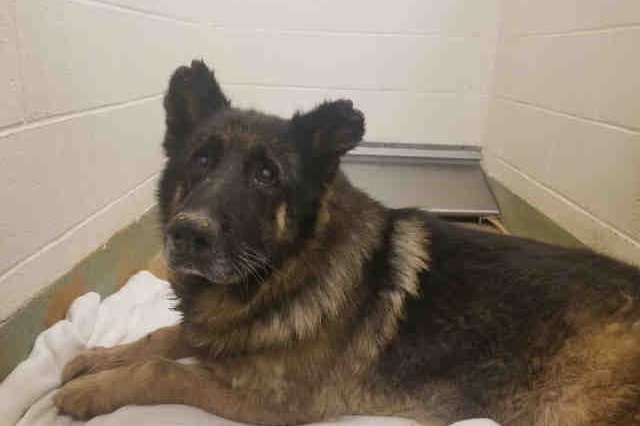 There was a very deep sense of urgency to get Bear our as we knew there were undiagnosed health issues that a high kill shelter would not treat. No other rescue or individual expressed any interest in him. 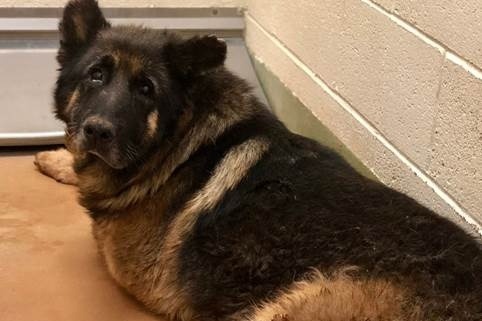 We at Happy Hearts German Shepherd Rescue could not turn a blind eye. Our vet advised us that his bladder wasn’t fully functioning and that he needed a catheter every three to four days so he wouldn’t lay in his own urine. The vet believes the bladder issues are tied to the inability to stand and walk, possibly due to a slipped disc. We are in the process of getting an estimate from a veterinary neurosurgeon as to the complete costs, but we won’t know anything until further testing can be done. We need to rally around him and give him the life he deserves. This is where we need YOUR help. We have taken in several dogs with high medical bills over the last three months which has depleted our savings. Bear is otherwise in good health and a great candidate for adoption! He is a bright, intelligent boy who loves everyone he meets, and gets along great with other dogs. Happy Hearts German Shepherd Rescue is a 501 (c)3 that relies entirely on donations from kind people like you! Your gift allows us to continue the work of saving 11th hour dogs, one at a time.